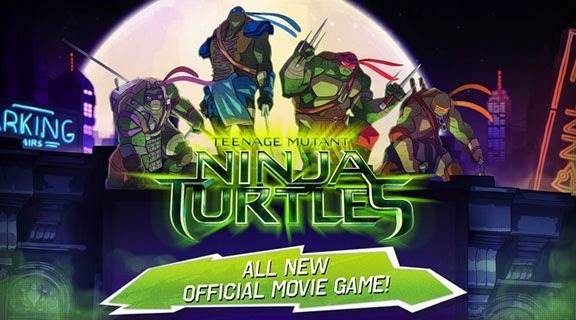 With the upcoming release of the Michael Bay produced Teenage Mutant Ninja Turtles movie reboot hitting theaters on August 8th, some games would be expected in addition to the millions of miscellaneous tie-ins and other product endorsements I've been seeing. Aside from the Nintendo 3DS one that isn't out yet, or the Xbox Kinect game, this one is pretty decent. 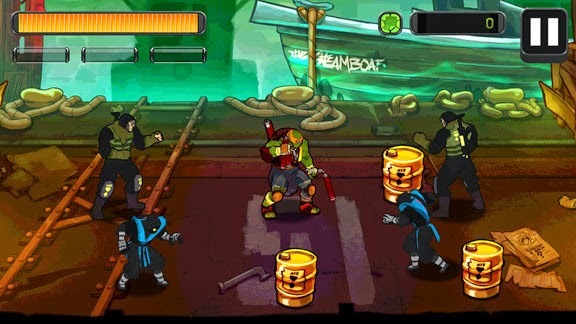 Made by The Game Bakers, a small studio known for the oddball fighting brawler Combo Crew, the new Teenage Mutant Ninja Turtles Official Movie Game is a cell-shaded hack-n-slash brawler game relying on taps and slashes for attacks battling enemies to clear the streets of New York City of bad-guy rubbish. The story mode is written by Tom Waltz who has been writing the very excellent IDW comic book series. The story is simple enough- the turtles are out to take out the increasing number of bad guys and find a mysterious ninja that's behind this. Who that "ninja" is has never been considered a ninja, but oh well. The game's trophies let you know who the bosses are, and this game gets bonus points for including Bebop, Rocksteady, and Leatherhead. Combat is done through taps (for blocks and standard attack) and 4 different directional swipes to do combos- which are unlocked and chosen by the player for their personal play preferences as you progress through modes and rack up coins and red gems. Chain enough combos and you will unlock a 4-turtle "Turtle Power" mini-game in levels that allows you to call-in help from your 3 brothers to do massive damage to multiple enemies. In later levels these are quite helpful to use. 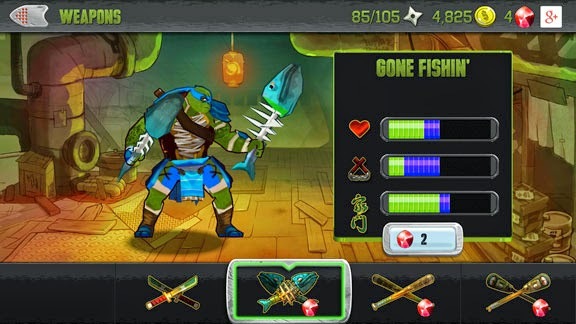 In addition each of the 4 turtles can be "trained" to upgrade their stats, and new weapons become available as you play- I personally like the chicken legs for Raphael and Leonardo's fish & bones for swords. I did notice a huge difficulty spike from level 28 on, possibly there to encourage the microtransactions in the store area to buy performance enhancing boosts to beat the last 6 levels. The boosts most helpful are the "Mean, Mean Mutagene" to double damage done for one level and the "Double Trouble" that doubles the speed of the Turtle Power meter. These are almost a necessity to get through the last few levels, and the guard break and life meter refill boosts help that go much smoother as well. The IAPs seem a bit shady, but if you save your in-game earned currencies then it won't be a problem. The Game Bakers have done very well here- the game is super fun and highly addicting. Even if the new film is bad, this game tie-in is more than worth the $3.99 cost. At first, and for the first 10-15 minutes of gameplay,I hated everything about it,but the more you play,the more you start to like it.Take it from a fan who has been a fan ever since he was 3,this game is a huge step in the right direction -fun,addicting,a brawler,no rap music,Bebop and Rocksteady...good things,good things.Sure,the new designs might bother some, and I actually disliked them a lot before I played this,but to be honest,in this game I rather like them. ~Ethel Gardner. You got it 100% right! This game actually was a grand surprise as I was expecting something far worse. As it is it's pretty entertaining and very addictive. A little part of me is wondering if they'll do any additions or DLC for this game to add levels or more characters or something. Very doubtful, but I can still hope!